There are a number of effective brushing techniques. Patients are advised to check with their dentist or hygienist to determine which technique is best for them since tooth position and gum conditions vary. 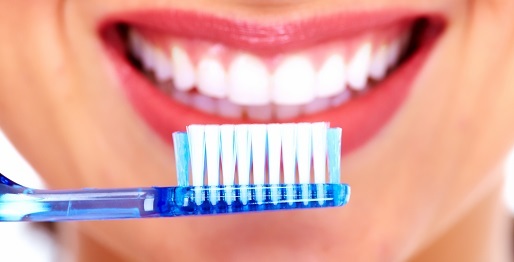 Place a toothbrush beside your teeth at a 45 degree angle and gently brush teeth in an elliptical motion. Brush the outside of the teeth, inside the teeth, you tongue and the chewing surfaces and in between teeth. Using a back and forth motion causes the gum surface to recede, or can expose the root surface or make the root surface tender. In general, a toothbrush head should be small for easy access. It should have a long, wide handle for a firm grasp. It should have soft, nylon bristles with round ends. Some brushes are too abrasive and can damage your gums. A soft, rounded, multi-tufted brush can clean teeth effectively. Press just firmly enough to reach the spaces between the teeth as well as the surface. Medium and hard bristles are not recommended.It might be a good idea to brush with the radio on, since dentists generally recommend brushing 3-4 minutes, the length of an average song. Using an egg timer is another way to measure your brushing time. Patients generallyÂ think they are brushing longer, but most spend less than a minute brushing. To make sure you are doing a thorough job and not missing any spots, patients are advised to brush the full 3-4 minutes twice a day, instead of brushing quickly five or more times through the day. Getting debris off teeth right away stops sugary snacks from turning to damaging acids, and catches starchy foods like potato chips before they turn to cavity-causing sugar. If you brush with fluoride tooth-paste in the morning and before going to bed, you don’tÂ even need to use toothpaste at work. You can just brush and rinse before heading back to the desk. If you don’tÂ have a toothbrush, rinsing your mouth with water for 30 seconds after lunch also helps.